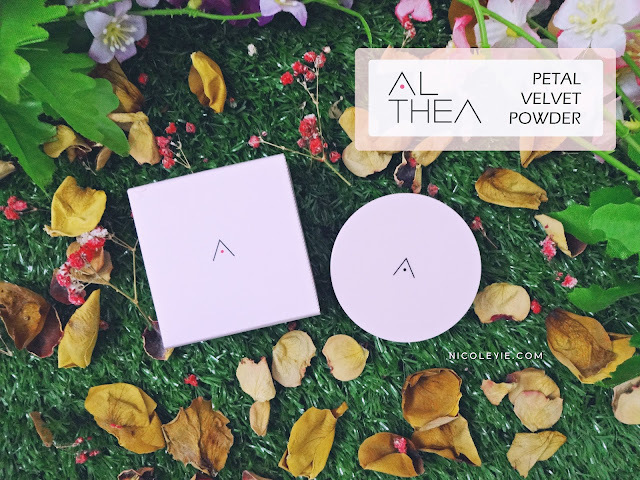 Althea has just celebrated their 2nd birthday last month (July) and this month, they have just launched their very first own product - the Althea Petal Velvet Powder! Are you excited to check it out? I am! This powder is a translucent powder that sets makeup and leaves behind a silky finish to the touch. In Malaysia, powder products are quite important to every girl because we need to set our makeup on to prevent them from smudges throughout the day, plus no one here likes oily skin! I was so excited for their own products launch cause their packaging is definitely gonna look as pretty as their brand itself, and I wasn't wrong at all because look at this simple pink packaging!! I'm guessing most of you have tried a few similar translucent powder brands from Korea, such as the Innisfree No Sebum Mineral Powder (I swear all beauty gurus owned this and recommended this), W.lab Sebum Out Finish Powder and so on, because they are all super affordable (only around MYR20 in Althea) and super nice to use! No doubt that the birth of this product is going to make those brands feel pressure cause it's another good but competitive product, plus it's cheaper!! Despite that it looked the same as most of the translucent powders out there, but choosing this because of the pink colour! The given puff is 13mm thick and fluffy! It grabs quite an amount of the powder and blends them very well! So what makes this product stands out from other translucent powders? 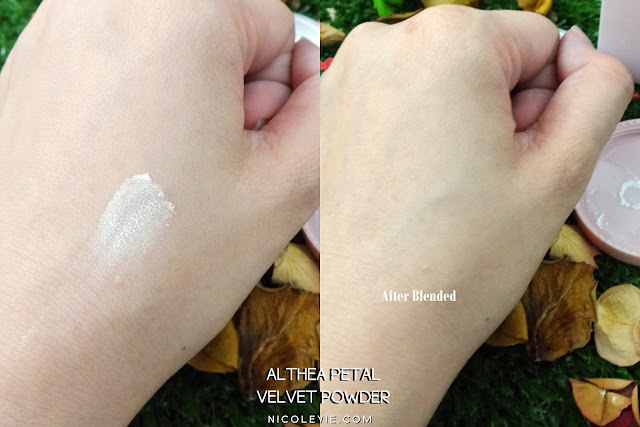 Unlike most of the powder products out there, the Althea Petal Velvet Powder is inspired by Korean Althea Petals that gives a silky velvety smooth finish, like a flower's gentle petals dancing on the skin. 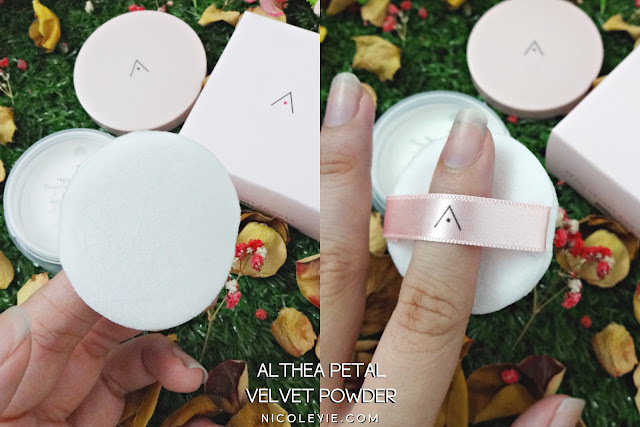 This Velvet Powder is infused with oil from Althea seeds and works to keep sebum production at bay without drying out the skin for a radiant, fresh look, all while giving out a gentle scent. Look at the super fine texture powder! This powder is also made with pure, natural and cruelty-free ingredients. The 100% pure silica has excellent oil-absorbing properties for long-lasting excess sebum control. Best to use it to set your makeup at the very last step of your makeup routine! Besides, this product features a lightweight natural mineral powder that has micro-fine particles that minimize the appearance of pores and fine lines to reveal a flawless and petal-like soft complexion. Its translucent and perfecting qualities also create a satin finish that mattifies without dehydrating the skin. Not sure if you noticed that super smooth and fairer part of my hand on the right image? It really does give a flawless effect! How To Use: Pick up product with a brush or puff provided and gently sweep onto the skin to keep your makeup looking great all day and stay shine-free! It works like wonder! I felt that my skin is so smooth after applying it! 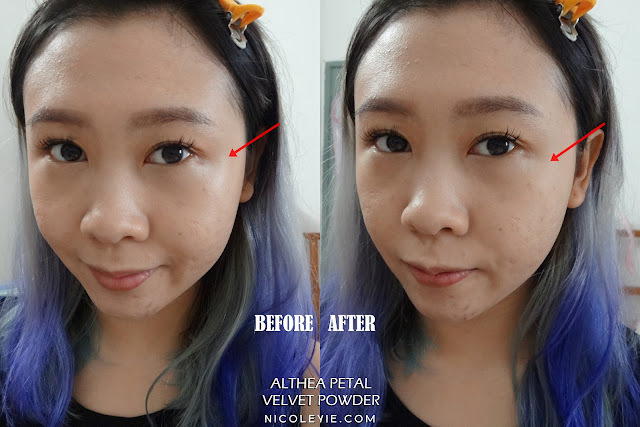 If you watched my makeup videos before, you will know that powder is very important for my under eye area because I really love to apply pencil liner at the outer corner of my under eyes, but they always get smudges easily. Powders is my important trick to make sure I don't have panda eyes throughout the day! Overall the product does what it says, but I'm madly in love with the super soft velvety texture! Love how it feels on my skin, and I can't stop touching my skin after applying it! Can really feel the difference compared to other translucent powders that I owned as they are not as fine and soft as this! The only thing I dislike is the flower scent? I personally don't like this kind of flower scent, but it definitely didn't affect how I feel about this product at all cause it's just a very mild scent.